In Texas, cilantro is a tried and true favorite. 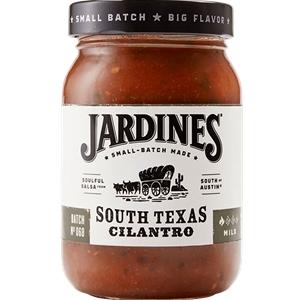 The Jardine's South Texas Cilantro Salsa takes fresh cilantro and mix it with a special combination of hearty tomatoes, chopped onions, diced carrots, smoky jalapenos and spices. Then Jardine's cooks it in small batches to ensure it achieves its bold natural flavor. The Sonoma green chiles that Jardine's selects to use in our authentic green chile salsas recipe are grown on one of the near ideal spots for growing green chiles, New Mexico. You'll appreciate the added flavor that the best ingredients bring to this salsa. Tomato, water, tomato paste, yellow onions, jalapeno peppers (jalapeno peppers, vinegar, salt, acetic acid), carrots, vinegar, bell peppers, cilantro, salt, dehydrated garlic, spices and xanthan gum (a natural thickener).